On Sunday we visited 168 Mall in Divisoria just to look around and have some food tripping. 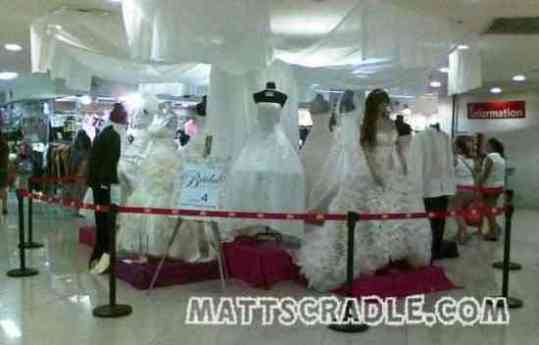 At the new entrance there are wide displays of wedding bridal gowns and groom suit. We got interested so we check the stalls at the fourth level just to know the price range for gowns with / without complete accessories. Among the three stalls we’ve asked, most of the bridal gowns are off-shoulder and the prices vary from P3500 to P6500, P18000 to P32000. I’ve asked the shop attendant for P32000 gown and she told me it has Swarovski crystal evenly distributed on the cloth that’s why it cost that much. Probably, if you’re an experienced price haggler you can get a gown of your choice at a lower price or if not at least bring one who can do the haggling for you. Ysabelle also offer interesting wedding packages, you may visit their website www.bridal-factory(dot)com for the details. For wedding make up artist check the link. Here is the link for custom made wedding shoes like the one below. * I got the details when we recently visited 168 Mall. Hi Joel I suggest you call the number on the post for your inquiries. Thanks. Hi Ma’am Lea, I suggest po you visit 168 mall for more choices. As far as I remember you can buy a wedding gown as low as P5000 plus. Hi Mary, please contact the numbers on the post. Hi Mary please inquire on the numbers on the post. hi there! !..which do u think is better when it comes to quality and price, (yes, for a wedding gown), 168 mall or ung mga shops sa loob ng Yangko Market, Ilaya? ?…thanks so much po!!.. Hi, di po kasi ako familiar sa yangko market, so I suggest 168 mall. 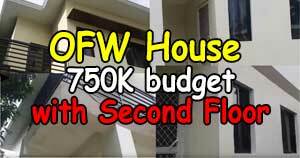 You can also check 2nd level of cluster building, tutuban mall for more choices po. 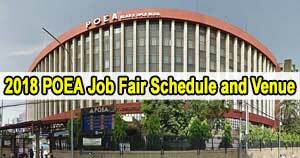 Hi Meralona, I suggest you visit tutuban mall and 168 mall in divisoria para po makapamili kayo at makatawad sa presyo. Hi Cristina, I can only give you answer base on my experience. 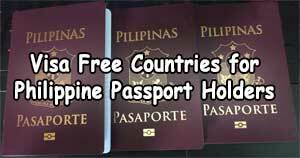 For 15 persons including groom and bride it would cost around 38K pesos. Lead time is 4 months. If you have further questions you can reply to this comment. Based on my experience, Yes. Hi Sam what do you mean po for 200 pax. Hi.. pwede po bang magpagawa ng gown? yung design ko manggagaling? hi! This is Minerva the owner of Mirielles creative Events. post. I dont know who posted the pictures. I lost my cellphone many times. and my email is already hacked. It is I who posted the picture. I inquired with you for my wedding last July 2012. It is you or your staff who gave me a flier. Since I know many will be looking for affordable wedding gown packages, I shared it here. To Ma’am Minerva, can u please post your contact number or email address for anyone who are interested to contact u regarding this matter. Thanks for posting this.. It’s very helpful.. By the way, halatang di nagbabasa ung mga unang nag comment.. May nagpa-quote na ng wedding package at may nagpagawa pa ng gown.. haha! Hi Jenny, I don’t have here wedding gown pictures. 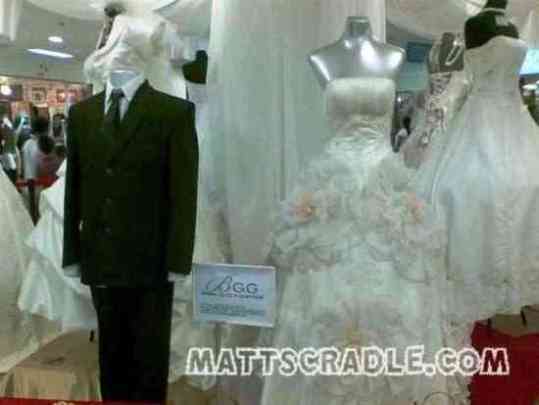 I suggest you go to 168 Mall in Divisoria for quality wedding gowns. Hi there. This post is very helpful. I’m getting married this december and still need to look for a gown. I was just wondering if there are any good quality yet affordable wedding gowns that are RTW for my 5’7″ height? I’m more or less a size 11 or Large. I’m going gown-hunting next week and would like to know what to expect when i get there. Many thanks! 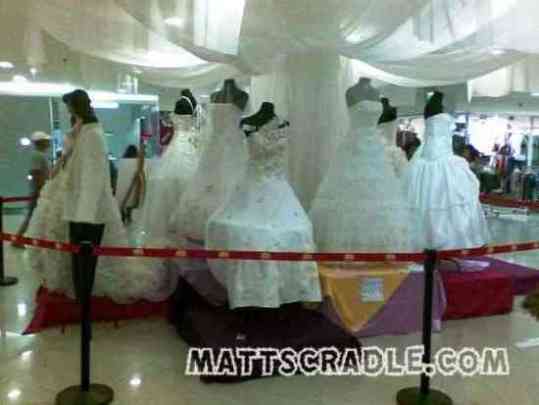 Hi Jamie, yeah there are ready to wear wedding gowns in Divisoria. Just go to fourth level of 168 Mall. hi good evening, do you have some pictures of gowns that worth 3500 to 6k? can you post it and label the price. 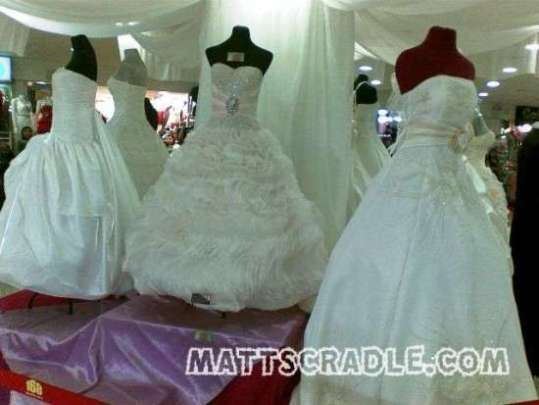 hi po, pwede po bang pa advise ng entourage dress po,..
Just to warn brides-to-be who are planning to buy at Divisoria, do whatever you can to avoid the stall Cherrick inside the Bridal gowns section of Tutuban Mall. It’s located on the entrance, so just avoid it when you can. The owner’s deceptive scheme is that she will wholeheartedly accept your designs with your downpayment and tell you that her tailors can do your designs for you. On the day of your fitting day (about two weeks delayed than what you first scheduled), you’ll be surprised that she won’t follow the design you gave. And when you ask for alteration, she will give many excuses not to accept any alteration on the designs. She has prepared all the answers for any comment that you’ll give, even though she clearly didn’t follow what you discussed before. May I please have your updated email? I have a dress Id like to inquire how much you would charge. hi, i’ m searching for RTW wedding gown. can you please send me some design of your wedding dresses. 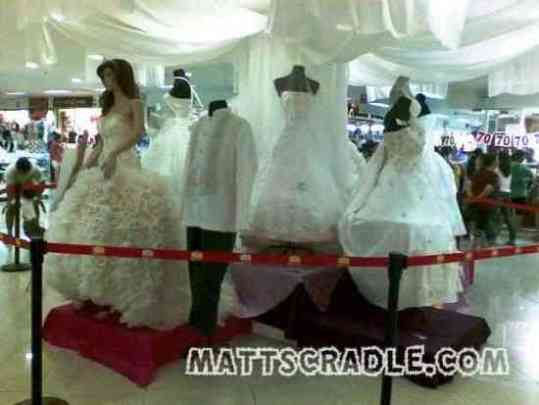 I would suggest maam that you go to 168 Mall at the 4th floor to see the actual gowns. You can also ask the price and maybe buy one on the spot.